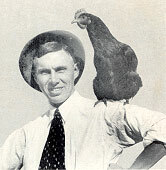 Murray McMurray officially started his chicken business in 1917. He had always been interested in poultry as a young man and particularly enjoyed showing birds at the local and state fairs. He was in the banking business at this time and sold baby chicks through the bank to area farmers and hobbyists. When incubators became available he was able to purchase several small Buckeye incubators to hatch and sell his own stock. In 1919 he sent out his first catalog and price list and continued to carry on both the banking and the hatchery business. During the early stages of the depression his bank went broke. It was then he decided to go into the hatchery and mail order baby chick business full time. During the decades of the 30's and 40's, McMurray Hatchery continued to grow. The hatchery served two types of customers: the local area farmer and the mail order customer. One customer lived right in our backyard and the other may have lived a thousand miles away. The McMurray Hatchery catalog bridged the distance gap between the hatchery and the mail order customer. The arrival of the beautiful color catalog with its description of the birds was always anxiously anticipated as it still is today, many years later. The 1950's and early 1960's were a difficult time to be in the hatchery business. Agriculture was changing very rapidly. Livestock was disappearing and not being replaced. There were fewer and fewer farm flocks and people didn't have time or money for poultry. Railroads had been the major carriers of baby chicks but were diminishing in both size and number. The advent of the airlines carrying mail was a lifesaver for McMurray Hatchery and all hatcheries still in business. It allowed them to continue dealing with customers who lived many miles away. The airlines made it possible to get day old poultry to a customer within the 72-hour period required by the U.S. Postal Service. Anyone who wanted poultry could purchase it. They could have it delivered to their home regardless of how far they lived from a hatchery. 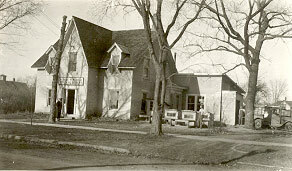 For 74 years, McMurray Hatchery operated at 609 Ohio Street in Webster City. This was an old gray house that had been converted to a hatchery. In the house next door, a former duplex stood one-half of the office. In the next house east, stood the other half of the office. The decade of the 1980's and early 90's saw many changes at McMurray Hatchery. The days of the poultry flock on every farm were gone. Today, 99% of our business is done through our catalog, which serves the small farm flock and the hobbyist. Baby chicks have always been the main staple of the business. Today ducklings, goslings, guinea keats, turkey poults, peafowl, and game birds are hatched and shipped through the mail. Orders for poultry books, medicine, incubators, hatching eggs, equipment, and other poultry related products are shipped daily from our hatchery. Many of the items are shipped to rural areas where these products are sometimes hard to find. We are making every effort to be a one-stop poultry shop. 1991 the new hatchery was built, a 26,000 square foot building. The entire hatching operation is now state-of-the-art. We are using Nature Form setters and hatchers. Our hatchery area is broken into five parts. We have separate rooms for egg storage and preparation, setting (incubation), hatching, washing /clean up, and a workroom. We try to maintain a very high level of sanitation throughout the hatchery. This facility also includes our customer service center with our friendly staff to serve you. We do not allow public tours, but you can take a Video Tour of our Hatchery.